DUG Insight User ManualFrequently Asked QuestionsFrequently Asked Questions HorizonsHow do I decimate an interpolated surface back to its original picked lines? If you picked your original surface on a regular grid, you can extract the original picks as a lattice horizon using Horizon Maths. 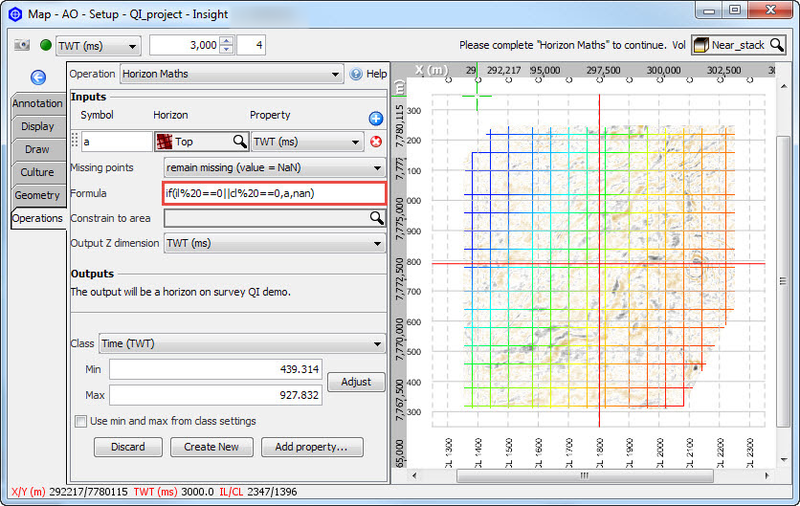 In the Map View, select Horizon Maths and input your IL/CL horizon. Call it 'a'. Define the formula: if( il % 10 == 0 || cl % 10 == 0, a, nan). This formula translates as: Keep inlines and crosslines that, when divided by ten, have a remainder of zero. Note: The modulus operation (%) used in this formula is a fast way to find the remainder after dividing by some value. In cases where the horizon locations are not evenly divisible by the lattice increment (i.e. there is some offset), no picks will be returned. If inline values are on the sequence (105, 115, 125...), (il % 10) will never be zero. If crossline values fall on odd values (101, 103, 105...), (cl % 2) will never be zero. In these cases, add or subtract a constant so the result is evenly divisible by your lattice increment. If inline values are on the sequence (105, 115, 125...), ((il + 5) % 10) will work. If crossline values fall on odd values (101, 103, 105...), ((cl - 1) % 2) will work. Prev: Why is the amplitude value as shown by the cursor different than the horizon extracted value?